Solenoid cover can be turned by 180° to change the Position of manual override. Solenoid capable of turning 360°. High performance PTFE Glydring seals. 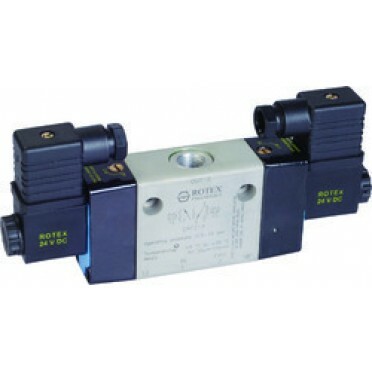 Connection Type : G 1/2"
Features :5/2 Spool Type Double Solenoid Valve VAJ214Counts in any position.Solenoid cover can be tu.. Features :Mounts in any position.High performance PTFE Gliding seals.Solenoid capable of turning 360.. Features :All ports on manifold, hence reduces cost of tubing & ease of maintenance.Mounts in an.. Features :Subbase design for fast installation & removal.Solenoid capable of turning 360°.Soleno.. Features :Bubble tight shut off.Mounts in any position.Suitable for vacuum up to 10-6 torr.Vibration.. Features :Ideally suited where speed control by blocking exhaust is desiredPower fail to resetNon re.. Specifications :Size: 1/2"Body: AluminiumSeals: Nitrile / RubberPressure: 2.5 to 10 Kg/cm²Temp: 5 to.. Features :Direct Acting.Mounts In Any Position.Solenoid Capable Of Turning 360°Solenoid Continuous D..